Genome-wide association studies (GWAS) have been providing valuable insight to the genetics of common and complex diseases for nearly 10 years. Despite some assertions to the contrary, GWAS is not dead. GWAS is alive and well, and remains a viable technology for genetic discovery. GWAS data formats, usability, and data management techniques. Imputation: Myths, facts, and when to use it. Quality assurance: What questions should you be asking about your data? Genotype association testing and statistics: Contingency tables, linear and logistic regression, Mixed Linear Models, and more. Visualizations including Manhattan Plots, linkage disequilibrium plots, and genomic annotation sources. Exploring public databases to investigate your results. 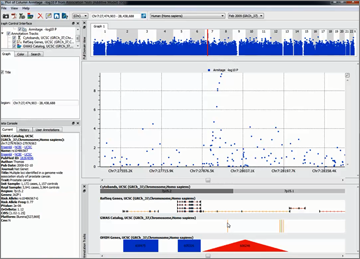 Tips for using exome chips and other targeted genotyping platforms. Along the way, Dr. Christensen will highlight best practice approaches and common pitfalls to avoid. Golden Helix SNP & Variation Suite (SVS) software will be used to demonstrate many of these concepts.